Ask Matt: Red Wine and Dark Chocolate? “Ask Matt Caputo” is an ongoing feature where Matt answers commonly asked questions from the market. This week, he reviews selections for a pairing we can’t necessarily get behind – red wine and dark chocolate – but don’t want to leave you hanging (without chocolate, that is). I know wine doesn’t generally work as a good pairing with chocolate but do you have any recommendations for California wines and chocolate from makers in the USA? PSST! Want to know more? 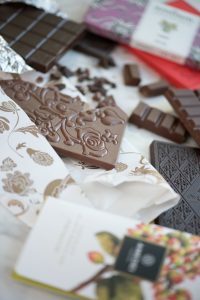 Join us at an Intro to Fine Chocolate class! Disclaimer: While Matt Caputo is a Certified Cheese Professional and specialty food fanatic, he is not a medical professional, doctor, or certified nutritionist. Please consult with your doctor or other qualified health care professional before making any healthcare decisions, diagnostics or treatment decisions based on Matt’s answers.